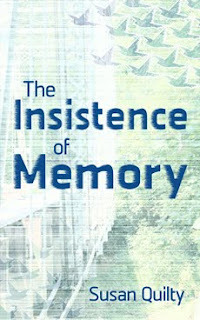 The Insistence of Memory, is available online at both Amazon (paperback and Kindle) and Barnes & Noble (paperback). Now, Jeff’s partner-in-crime wants to turn their unfinished project into a money-making scheme, while Joanne’s best friend argues the dangers of dredging up buried memories. Joanne’s heartache takea a backseat as she struggles to find balance between supporting the future of Jeff’s incredible discovery and keeping her own troubled history safely locked in the past. The Insistence of Memory is not the first novel that I've started writing, but it is the first that I've finished and published. It reads as a bit of a psychological thriller, with some light elements of sci-fi and mystery. While I came up with the general idea for this book several years ago, the plot has changed quite a bit from my original idea. Initially, my story about watching someone else's recorded memories was based on the growing popularity of reality TV. I had begun imagining what could happen to our society if our private thoughts were easily read and shared. As the book developed, a story about that sort of dystopian future was set aside to focus more on what might happen in the earliest days of discovering thought-recording technology. Who might want to advance or prevent that technology? And what would an average person do if confronted with that choice?